Last night I went to Walmart with John for flip-flops, because that's what you we do at 11:30 on a Thursday night. All the women's flip-flops were either ugly or rock hard, though, so I wandered into the kids' section. My wee hobbit feet can fit both boys' and girls' sizes, though I find little boys' shoes are wider and generally more comfy. That's when I saw them. Waaay down on the bottom rack, gleaming in the heavenly light of the shuttered layaway counter: the most beautiful shoes in the world. "JOHN." I hissed. "JOHN. LOOK AT THOSE SHOES." John looked, and immediately said, "Oh, you have to buy those." "Right?" I was already clutching them to my chest. "Arg, they're a size too small. And they're the last pair! Noooo!" "It's OK, I'm sure another store will have them. We can go check after this, if you like. Jen. Jen, it's fine. We can... are you OK?" My yelp of pain became a hoot of triumph. "IT FITS!!" "Babe, I'm sure another store will have the next size. Just take that off and... now what are you doing? Are you even listening?" I had my phone out, and was twisting my leg around in front of me. "How do people take good pictures of their feet, anyway?" At this point John sighed and wandered off, but many cellphone pictures later he made me take off THE MOST BEAUTIFUL SHOE IN THE WORLD so we could go home. And since it was late, we didn't check another store. So I still don't own a pair... yet. But I will. Oh yes.... I WILL. After John made me take the shoe off I did another photo sesh - accompanied by lots of cooing. "Who's the prettiest widdle shoe in the whole wide world? IT'S YOU." "JUST A FEW MORE PICTURES." Now I'm off to find these in a size 4. Now, who wants to raid the kids' shoe section with me?! UPDATE: We found my size. I repeat, we found my size. PS - Thanks again for being awesome, guys. A few days ago I shared on FB that I'd been struggling with inexplicable dizzy spells - which of course sparked ALL the anxiety attacks - and once again this community stepped up and offered suggestions and encouragement and just generally made me feel sane again. So thank you. It's looking like my sinuses were/are the culprit after all, since I started getting some ear pain the very next day. I've been taking the appropriate meds, drinking lots of water, etc, and the world is gradually getting less wibbly-wobbly, so no need to worry. Clearly all I need now is some magic glitter shoes. 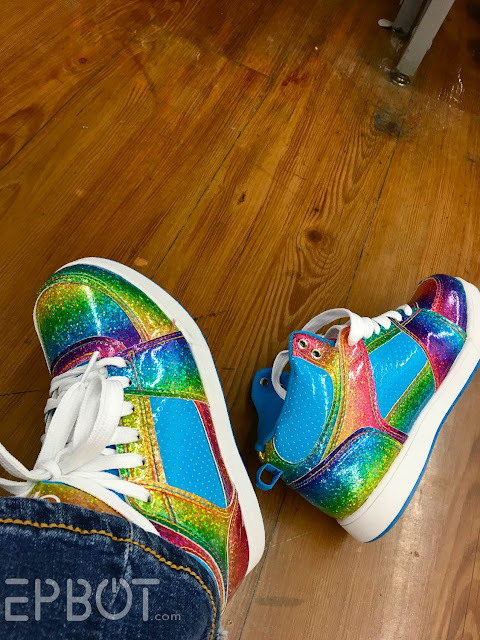 There is free unicorn included in every purchase of these shoes, yes? I think I should buy matching pairs for me and my daughter. Because you are right. Those shoes are the best. You have tiny feet. I have huge clod hoppers. I wear a 13. I need these shoes!!!! I wore shoes in the kid's size range into high school, and was seriously disappointed when I finally hit a growth spurt and couldn't wear them anymore. Today is another one of those times I'm really disappointed. Those are amazing shoes. I bought my wife a pair of those shoes from our local WM. ha! Glad to hear you're feeling better, Jen, and glad to hear our immediate and volumenous response was comforting :-). We loves ya! so unfair that they never make shoes as cute as this in a ladies 10.. Tiny feet-ed people make me cry. And you can buy all the shoelaces to go with them! Hmmm...hipster Rainbow Brite cosplay with those shoes? My 1984-year self just yelped in happiness. They would have totally matched my yellow unicorn and rainbow sparkle shirt (that I also still covet). But I would still totally wear those now, but my feet are sadly far too large. I envy you and hope you go get some right now! Magic glitter shoes make everything better! P.S. - so glad you are feeling better! ME. I DO. I WEAR A 7 WITH ROOM TO SPARE. I feel like those are the shoes that would be worn by Dorothy's daughter if they ever did a spinoff show of Wizard of OZ a la Sofia the First, and little Dot would click them together so she could visit her friends there. Fellow Epbotters, I feel we must make this a group effort. 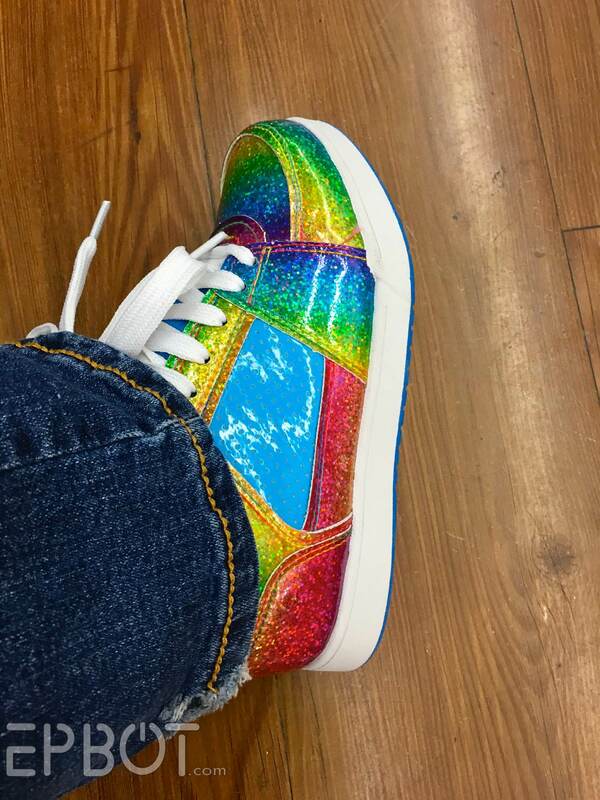 Fan out and scour your local Wal-Mart and FIND JEN THESE SHOES! You MUST get different colored shoelaces! Maybe even rainbow laces! Oooh, pretty. I have small-ish (OK, so they are as wide as they are long, size 5.5-6DDD) and nothing makes me happier than to pay half the price for shoes! My hubby doesn't think adults should be able to stand with such small feet. Maybe that is why I have "issues" with vertigo? Hahahaha! I can't tell you how often I find children's stuff that I WANT. WANT with the intensity of a dying sun. Just last weekend my husband and I were in Goodwill and I found this tshirt in a pretty yellow color that said "My little Epona" and had a picture of Link's horse drawn in the style of the new My Little Pony. Of course it was for children, and of course I bought it anyway. Luckily for me my body decided to skip developing breasts somewhere along the line and it actually fits (snugly). Also, I am so happy to hear you are feeling better! As a chronic dizziness-sufferer I can attest to how little fun it is! Okay, who else read the title of this post and then couldn't scroll down fast enough past all the words that were in the way just to get a look at what Jen's idea of the most beautiful shoes in the world look like? Obviously, delay of gratification is not my thing. I wasn't disappointed by the rainbow glitters. And, then, of course I went back to read the story. Jen, what are you going to do when you get 20 pairs of these in the mail from all over the country? You'll have to start a glittery rainbow shoes giveaway contest. I'm making a trip tonight to my three nearest Walmarts to see if there are any left in your size, and I hate Walmart. Fingers crossed. O.M.G. These are SOOOOoo you!!! You MUST own them!! I often wish I had smaller feet. And it makes no sense because I'm so short, but have unusually large feet for my height. Now everyone else needs to send you glittery rainbow shoelaces to go with them, because clearly, those white shoelaces aren't gonna cut it! You just opened up a while new world for me!! I wear a woman's 6!! Next time I'm in target, I'm so checking out the girls and boys shoes!! Ooooooh! I could totally fit into a pair of those shoes! Off to Walmart! I am strongly reminded of Lisa Frank stuff! I love them. I have tiny feet too. And I need those shoes!!! I would have loved those shoes when I was a little girl! My favorite doll was Rainbow Brite and when I saw the pic I squealed inside, thinking Rainbow Brite rides again! Alas my feet are an unusual size, not big or small, just uniquely shaped so I have a hard time even finding cute shoes, let alone squeal worthy magical glitter shoes. I wear a size 5 girls and have discovered kids get way better looking and comfier shoes. I bought a pair of glittery silver kids shoes a few years ago and when they starred to wear out I found another pair. I always get compliments from adults and kids when I wear them. Sigh...I wear women's size 10 or 11. I will never fit in those. I saw a vintage type blue and pink nike sneakers a few months ago they looked totally 90's. But alas, they did not fit. Jen, I didn't read all of the posts so I don't know if anyone else found your shoes for you. Here's a link to ebay for the shoes. They're new and come in a size 4!!!! I just searched OP shoes rainbow glitter. I wear a size 11. Try finding cute shoes in that... Those are totally awesome! Size 8 and a proud shopper of the size 6 girl's section. I have the greatest gray sneakers with holograph dots all over them so that they shine like rainbows in the sun light. Payless girl's section. Guuuuuuys, I just got the cutest coloredy Chucks! They're fun & kinda nubbly! You too? Yay! Another grown woman with insanely small feet! (I usually say mine are fairy feet, because don't Hobbits have big feet compared to their small size?) I wear 3, but sometimes 4. Supposedly 3 in kids and 5 in women's are the same but women's 5s don't usually fit me right. Oh my God. Those are fantastic. I have massive feet, though, so I'd never be able to wear them. The struggle! Oh! I'm a woman's 6.5. Oh this opens all kinds of possibilities I never realized. Six *billion* comments later, that at 1 am I just cannot bring myself to read, I have 2 comments, One.. I shop in the kids section ALL the time, their shoes are prettier, and I'm a womens size 6ish. I get my socks in the kids section too. They're the only ones that fit. And two, I'm so very sure someone has mentioned this, but you can shop on walmartdotcom and have your items shipped to the store so you don't have to pay shipping. 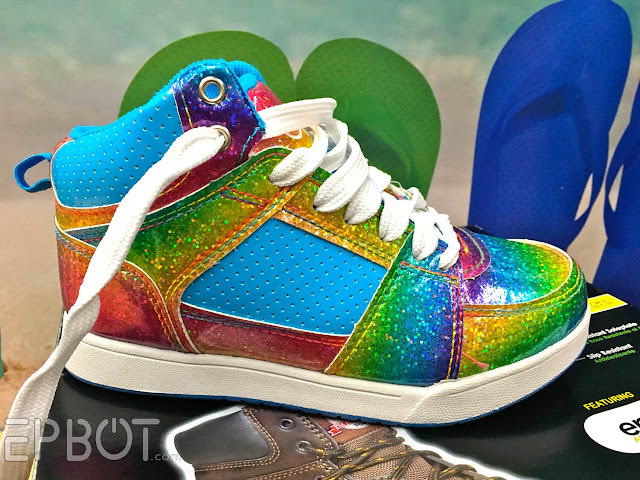 I want to buy those and cosplay Rainbow Brite. Wait, women's size 6 is the same as girls' 4?? Does that mean that girls' 5 is larger then women's 6? So weird. I honestly thought larger size=larger shoe, and it didn't really matter whether it was girls' or women's. But I wear 6 or 6 1/2 too, and I have trouble finding comfy shoes sometimes. I'll have to remember to try the larger girls' sizes. And yes, those shoes are beautiful. I was told that kids' shoe sizing is like men's shoes. Kids' 5, Kids' 6, Men's 7, Men's 8; both girls and boys shoes continue the number sizing into the men's sizes, and they are wide like men's shoes. In general, women can wear a kids' size that is 1-1/2 sizes smaller (Women's 7=Kids' 5.5), but they might be wider than you are used to wearing if you have a narrow foot. Awesome shoes. Not very helpful when you are in Walmart, but if I want to take pictures of my feet when I am home, I find lying on the bed with my legs in the air gives the best results. 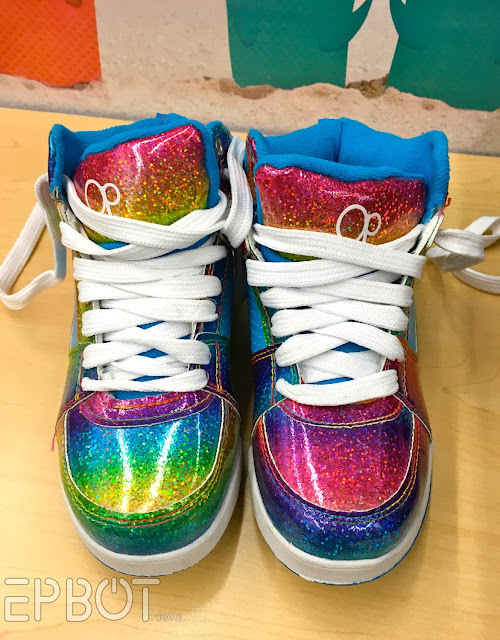 I do see Rainbow Brite *but* my first thought when I saw these shoes was to add some white wings and I'd have Rainbow Dash. I know her wings aren't white but thats what my brain came up with. Wowza! It's like the best parts of my eighties childhood have come back in shoe format! I have tiny feet too, so I often find that sneakers from the children's section fit me better (and are cheaper). I'll have to keep an eye out for these! We wear the same size! Those are great shoes. I work at Walmart and I want so many of the girls' shoes! I'm a women's 11-12 though so I can never have that luck of finding a big enough kid's pair to make off with. I have teeny tiny feet so I actually wear a size 3. I've managed to get away with wearing both kids shoes and kids clothes before it's awesome 'cause it's cheaper lol. I buy kids shoes all the time and I typically wear a women's size 7. I love it! Especially since plain canvas shoes cost twice as much when they're for women. Wow, they are hideous shoes. Ok...Im having the word "awesome" overload. I gotta go lay down. I just love the fact that John gets you. He totally gets you, and you are both lucky indeed. I am so envious. I wear a size 8 and can sometimes squeeze my feet into a size 7.5, but the shoes wear out really fast if I do. I'd love to be able to wear all sorts of great kid designs, but no way will I fit into them. It is like it is a prerequisite that you have to stop loving happy fun shoes when you are an adult. I also found and fell in love with the EXACT SAME SHOES a few months back, but alas, I am a women's size 11, so after a valiant effort of going to every Wal*Mart in our vicinity and checking online, I finally had to give up. Glad someone out there is enjoying them! I have to honestly say I'm amazing at your shoe size. I know there are women with the size you report of course, but as someone who was women's size 11 by sixth grade, I can't relate like at all. People are always surprised because size difference are smaller than they think so I hardly look abnormal. It's a pain to shop for shoes though! They seem to think panic attacks are normal for Hashimoto's (and treatable!). I don't have those kind of attacks, but I thought of you and your night battles, and I hope this helps a little. I really want a pair of those shoes. I looked on Amazon, but no luck. I looked on ebay and thought that I had found some. I ordered them and when they came, they were infant size. Where did you get some to fit adult feet? I have small feet too, so I think that I should be able to wear a youth size 6.